Baked Black Bean Tacos come together with only 4 ingredients you probably have in your pantry right now and are ready in just 15 minutes! These Healthy Black Bean Tacos make a perfect quick dinner for the busiest of nights. I love to solve your dinner dilemmas. And one thing I am REALLY good at is taking what seems like an empty kitchen and making something from nothing. I can’t tell you how many people text me in a week and say, Hey Kristen I have x, y, and z in my pantry–what can I make for dinner? There is thrill for me in that challenge. But I realize that while I have many 30 minute meals, and even a post about what to make when you don’t feel like cooking, I sometimes neglect to share with you the SIMPLEST DINNER RECIPES. Like my Black Bean Taco Recipe. You guys–these black bean tacos can be made with just 4 ingredients. Yep–4 INGREDIENTS!!! Re-fried black beans, taco seasoning, cheese, and taco shells. These Black Bean tacos can really be just that easy. Your family doesn’t like black beans? Or you only have Pinto Beans in your pantry–no sweat, use whatever beans you have or you like! 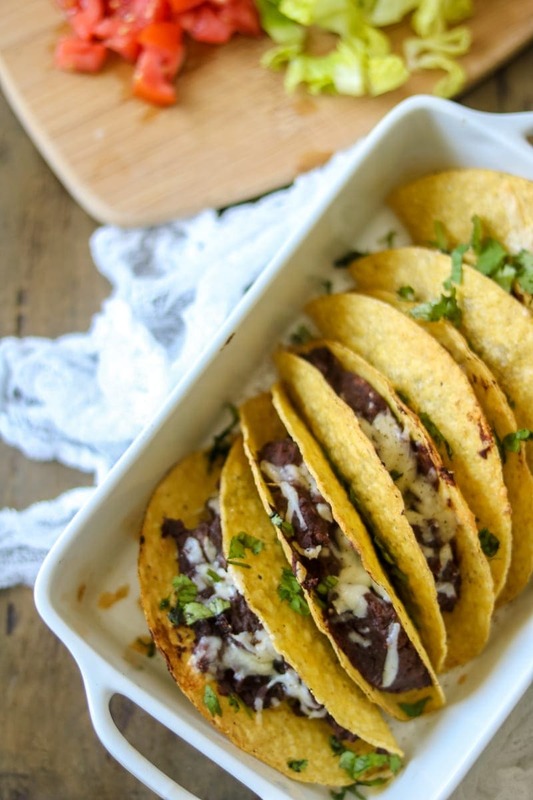 I spread the black bean mixture into Hard Corn Taco Shells to keep these Gluten-Free Black Bean Tacos. However, you can use any taco shell or tortilla you would like. I love to use sharp white cheddar cheese on these Baked Tacos, but use any cheese you like (feta is great and so is good old mild cheddar.) Or keep the cheese off for a Vegan Black Bean Taco. Top Black bean tacos anyway you like. My family loves shredded lettuce and chopped tomatoes, but avocados, sour cream, hot sauce, onions, etc would all be great options for toppings. Baked Black Bean Tacos are an easy dinner that can be ready in 15 minutes! Arrange Taco Shells upright in baking dish (use crumbled up foil if needed to help shells stay upright.) and bake for 3 minutes. 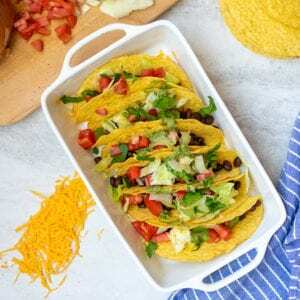 Remove taco shells form oven and sprinkle thin layer of shredded cheese over bottom of shells. Return to oven for 5 minutes or until cheese is melted. Mix together beans and taco seasoning and then scoop about 1/4 cup beans onto each taco. Sprinkle with additional cheese and return to the oven for 5 minutes, or beans are warmed through and cheese is melted. Serve with desired toppings and avocado cream. In a small food processor or blender, mix together avocados, salt, lime juice, and cilantro together until smooth. Or simply mash together with the a fork for a chunkier avocado mash. Black beans in tacos! How amazing and delicious, healthy and so easy to make. These are SO easy and tasty aren’t they! Tacos are a weekly occurrence at my house and these were delicious! I will be making them again! I am so glad you enjoyed these Jillian! That is a great tip! Thanks Hazel!